By Michael Diamond-- On Monday, January 18th, 60 members of the Toronto UJA Israel Engagement Mission met at Kibbutz Shefayim north of Tel Aviv to begin a 6 day, whirlwind tour focused on the selection of 24 ShinShinim for the following year, along with a multitude of opportunities to learn about Israel on the ground for this diverse group of people from 25 Toronto Jewish Institutions. Nowhere is there a mission such as this, where educators, Rabbis, Heads of School, leaders from Hillel Ontario and several youth groups, along with lay leaders from the community in support, gather together to “Do” Israel Engagement. Toronto is unique in the Diaspora in having the most extensive and intensive ShinShinim program- a program which brings young Israelis in their gap year before entering the IDF to Toronto for a year of service where they live with host families, and immerse themselves in Toronto Jewish life. The total number of ShinShinim for 2016-7 in the entire Diaspora is 115 and Toronto will have 24 of them, as we do this year. There will be 72 host families, and literally tens of thousands of children, adolescents, young adults, and older adults and seniors will experience these young people, sometimes intensely, sometimes less so, as individuals, and in groups, throughout the year. You will see them at major milestone events like UJA’s Walk with Israel and the Campaign Launch, they are seen as rock stars in our day and supplementary schools, and they integrate into their host families in ways which ensure enduring positive change and relationships with Israel. The Israel Engagement Team of UJA takes the selection process seriously, along with its partner, the Jewish Agency for Israel which screens over 2,000 candidates in order to provide Toronto and many other cities with the candidates who will be interviewed multiple times by the participating institutions in order to get the best fit for their particular roles. It is not an accident that, to a person, the ShinShinim are engaging, energetic, bright, knowledgeable, and highly capable of communicating their passion for Israel and Judaism. The ShinShinim program in Toronto has put Israel Engagement on the map. It has elevated the attention and the discussion around Israel and directed the focus where it should be- on the development of personal relationships between Toronto Jews of all ages, and Israelis and Israel. During the Mission, we interviewed and we made choices. 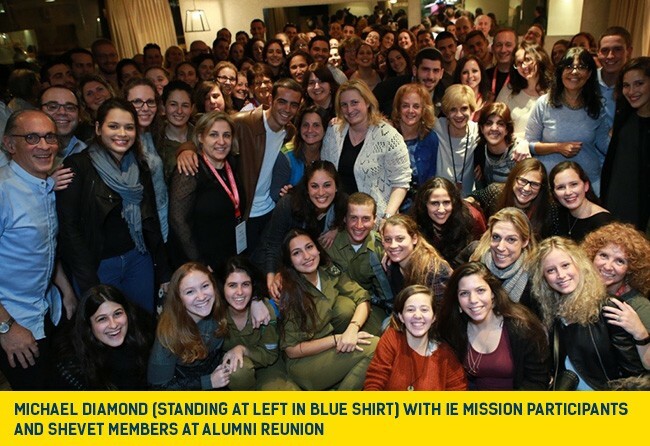 We met 48 young Israelis, every one of whom was exceptional, every one selected from a deep pool of 2,000 candidates by our partners, the Jewish Agency for Israel. They told us why they wanted to take a year of their life to invest in Toronto with us. They shared their excitement about making a difference in our community. They told us that they were so motivated that they “Insisted on Making a Difference” in Toronto. They are some of the best that Israel has to offer, and they are investing in the Toronto community. It was not easy to choose. On the first day we had the worst of what Israeli weather could offer- cold, driving rain, as we interviewed. It was not easy to not take everyone- they were all so special. We looked for the best fits with each Jewish school or youth group or synagogue. And as we made our choices, finally, at noon on the second day, the rain stopped and the sun came out and we relaxed with the choices we had made. The candidates left after 36 hours together, went back to their homes, and awaited the calls that night which would let them know, as they were with their families, whether they were going to be spending a year in Toronto. They had all spent countless hours over many months going through a rigorous selection process with the Jewish Agency and they all deserved to be chosen. And how the squeals of excitement were heard over the phone as the 24 positive calls were made later that evening. How proud their brothers and sisters and parents were that those 24 had been chosen as being the best fit for what we needed in Toronto. And how sad the other 24 applicants were when they learned that their adventure in life would have to be elsewhere next year and not in Toronto, the city that is known to have the ShinShinim program that everyone wants to be part of. And now it was time for us to learn- about Israel and Jewish Peoplehood, together, at Beit Hatfutsot- the Museum of the Jewish People- in Tel Aviv. There, we were treated to the many issues surrounding what it means to be Jewish, or not, in 2016. We heard a lecture about Israeli TV sitcoms which reflected so well the evolution of, and components of Israeli society. We were guided through parts of Tel Aviv examining some of the best street art in the world. And we ended our day of learning with an extraordinary musical presentation which told us the hitherto untold stories behind the creation of the Israeli anthem, Hatikvah, regarded by many as the most beautiful anthem in the world, a presentation which led most of us to well up with Jewish emotion at its conclusion. And this learning is not static- in the company of other educators and lay leaders, all dedicated to Jewish life in Toronto, we generated new ideas, new ways to provide Israel engagement experiences to our young people and adults. We talked about sharing the cost of visits to Toronto from some of our incredible presenters so that this wealth of knowledge could be shared by our teachers and parents and Board members and other stakeholders. We knew that the things we learned and the emotions we felt needed to be brought back to our community. And then, a highlight for many of us in our Jewish lives- we reunited with over 70 of our ShinShinim alumni now in Israel at a restaurant in Tel Aviv at the annual reunion dinner- most of whom travelled for many hours to join us from their homes and army bases. These are not just any young Israelis- these are the kids who lived in our homes and invested in our children, went to our camps, and spent their days in our schools and synagogues. These are the incredible young people we learned to appreciate and respect and love during their year in Toronto, and with whom we have not only maintained our relationships, but have strengthened them over the years. Their families are those who we speak to while in Toronto and visit when we are in Israel. When they get married- and we had our first ShinShin marriage only a few months back- we are invited to their weddings. They return to Toronto for our B’nei Mitzvahs or just to visit. And through it all, they remain our young friends as they wind their way through their Israeli lives. And at the end of the week, we gathered with the 24 chosen young Israelis, for a Shabbaton in Jerusalem to begin the next chapter in their lives. We got to know them that much better, we talked about life in Toronto, and they began the preparation for the next great stage in their lives- making our community stronger by building stronger connections with Israel, and becoming personally stronger and more Jewishly connected in the process. And then their parents joined us- as the chosen ones led us in a Havdalah service to close Shabbat, and we interacted together as one big Jewish Family- 60 older Canadians, with the 24 newly chosen ShinShinim, along with many of their alumni predecessors, joined by their Israeli parents, all sharing in the excitement of the people to people connection between Toronto and Israel that can only come from a program like this. We kvelled, we marveled, we strived, we interacted and created, we generated new ideas to strengthen Jewish life around Israel in Toronto. We reunited with former ShinShinim and learned of their leadership work in Israel, heard of their experiences in the IDF and university, and felt intense pride that we had a hand in helping these young Jews to become the best that they can be. And we returned with the knowledge that we would be introducing another 24 outstanding young Israelis into the Toronto community in 2016-7, our tenth year of this incredible program. With thanks to UJA Federation, to the Jewish Agency for Israel, to the Beit Hatfutsot - Museum of the Jewish People and the Nadav Foundation, and to each and every one of the professionals and lay leaders from the Toronto Jewish Community who make this incredible program possible. And of course, to every one of our ShinShinim new and old, and their families, for another exceptional experience in Israel.